What's the Christian connection to Valentine's Day? 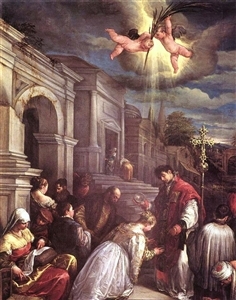 St. Valentine baptizing St. Lucilla, by artist Jacopo Bassano. What does a Christian saint have to do with candy hearts and chocolates? Not much, to tell the truth. It’s another example of what happens when Christian faith intersects with pagan custom: a tradition whose origins remain unclear. Valentine’s Day is the feast day of St. Valentine. It is not certain who this saint was. There are at least two individuals named Valentine (Lat. Valentinus) who might be at the heart, no pun intended, of the tradition. One Valentine was a Roman priest who died in AD 269 under Emperor Claudius II Gothicus. He was executed for helping Christian martyrs. He refused to renounce his faith and became a martyr himself, being beaten to death and beheaded. According to tradition, this happened on Feb. 14. A second candidate is a bishop from central Italy who was executed in Rome. Other traditions hold that both men also performed marriages that were considered illegal because they occurred during a time of war. In AD 469, Pope Gelasius set Feb. 14 as the feast day to honor this Christian martyr and saint. St. Valentine was said to have suffered from epilepsy and so became the patron saint of those who suffer epilepsy. Now how and where did all the romance stuff come from, you ask? That’s where the syncretism comes in. To read more of this article from American University's United Methodist Community, click here. * The United Methodist Community is an open and ecumenical fellowship for all students, faculty and staff at the American University in Washington, D.C.